Some very good friends of ours got married this weekend and it was such a lovely wedding. I was excited to finally able to give them their quilt! The pattern is from my one a day 9 patch quilt along that I did a few summers ago. (The links are on my sidebar.) Since my friend requested fall colors for the quilt, I used 2 jelly rolls of Kona cotton, in the dark and dusky color ways. I had a few leftover strips from the jelly rolls, but I made a few blocks from other solid fabrics from my stash, due to the color scheme. The sashing is bella solid, from Moda, which is completely lovely to work with. I'm not sure what color it is, though. I quilted it with a simple grid on the diagonal in natural colored thread. I must be weird, because I enjoy that type of quilting...at least once in awhile. It only took me a few days to quilt it. I did a lot of praying for the couple while I was working on it. I love doing that if I have a specific recipient in mind when making a quilt. I dug out all the brown scraps I could find for binding from my scrap bins. They are all the same color...I had plenty of pieces leftover from making my boys' star wars robes, among other projects. I had more than the usual amount of seams in the binding, but I didn't mind...it was nice not to have to buy additional fabric. This is one case where it's a good thing that I throw very little away! The back was pieced from the stash. I had these colors set aside for a quilt top, (I had a pattern picked out and everything), but I was delighted to use them for the back instead. It's a lovely way to burn though 5+ yards of stash! And that's one less quilt on my list to make. Yay! The quilt measures about 66" x 90". I made it a twin size so they could use it on the back of the couch or on a twin bed in their guest room. I finished it back in July, but I took photos and added the label on the morning of the wedding. I'm such a procrastinator sometimes! I'm glad this quilt is compete, that it's off to it's new home. I actually enjoyed working out of my normal color scheme and I'm pleased with how it came together. It seems like every time I post about a retreat, I have questions about flying with a sewing machine. I thought it would be a good time to talk about my (limited) experience with this. Last November, when I flew to Colorado, I did take my JUKI with me, since it would be very hard to teach machine quilting without my own machine. The first thing I did was to call and ask the airline about it. The airline I flew with said they had no regulations against carrying on a sewing machine. Phew! I certainly didn't want to check it! Who knows what it would go through until I could pick it up in baggage claim. I made sure to take out the needle, just in case that would cause any issues. I put my needles in my checked bag. I called my sewing machine dealer to ask the ideal way to travel with my JUKI. The man I spoke to told me that they aren't ideal for transporting. (Something I had already realized.) I asked about what kind of case and such, but he didn't have any recommendations. On the flight there, security did take my bag, open it and inspect it. On the flight home, they didn't. Overall, it wasn't so bad flying with my sewing machine. I was pretty nervous about it beforehand, but thankfully all went well. Here's hoping I can say the same this year! I'd be curious to hear if you have had any experience flying with your sewing machine. If so, how did it go? This is what it looked like at about 9 pm yesterday night. And this is what it looked like at about 4 pm today. I've been wanting to revamp my craft room for months, but I could never pull myself away from my 101 projects long enough to do it. It has been in quite a state of disarray for some time now, so I finally bit the bullet and decided to jump right in. As I've been priming the red walls (hate THAT job! ), I'm thinking about what I want it to look like. I think I need LESS storage. Sounds crazy, but the more storage I have, the more I'm going to fill up. I'm thinking yellow walls. White trim. Full design wall. I'm excited about seeing it come together! I have a prediction...being that it's my craft room, I bet it comes together in record time. At least that's the hope! Welcome to week 6 of the 36 patch quilt along! We had a CRAZY weekend here. My husband hosted a groom's shower/cookout on Friday night, and I had a garage sale on Saturday...both at our house. The garage AND the house needed to be cleaned for the weekend. What poor planning THAT was! We cleaned for hours upon hours, days upon days. Never again will we attempt that in one weekend again. But it's all over now, and I was thrilled to wake up and have time to sew this morning. Hurray! I had made a few blocks earlier in the week (I don't know when I had the time! ), and I finished the final 5 this morning....so here are my last 7 blocks for the quilt along. Yippee! I can hardly wait to start playing with layouts! Next week I plan to give brief assembly instructions for the quilt top and that will wrap up our QAL. I'd like to thank all of you who are quilting along with me! I've really enjoyed it and I have heard from MANY of you that you have enjoyed it, too. So glad to hear it! Please remember to add your photos to the flickr group so we can all see what you are making. I finished this quilt up back in April, but I drug my feet writing the tutorial for a few months. All that to say, I'm so excited to finally be posting this quilt! It's made with Strawberry Fields fabric, designed by Joanna of Fig Tree Quilts. I LOVE THIS FABRIC! In fact, I think this quilt may be one of my top 5 favorite quilts I've ever made! 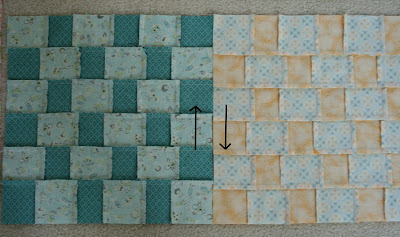 (Even though it is strip pieced, which is NOT my favorite technique.) But, sometimes you gotta do what you gotta do! :) Actually, strip piecing made quick work of the top. One of my favorite parts of the quilt is the little 2" blocks at the top and the bottom of the quilt. Aren't they so sweet? I like having borders on only 2 sides. For quilting, I stippled it in cream thread. The red binding fabric is the cherry on top...the icing on the cake...my favorite binding ever! The tutorial is posted over here on the Moda Bake shop! 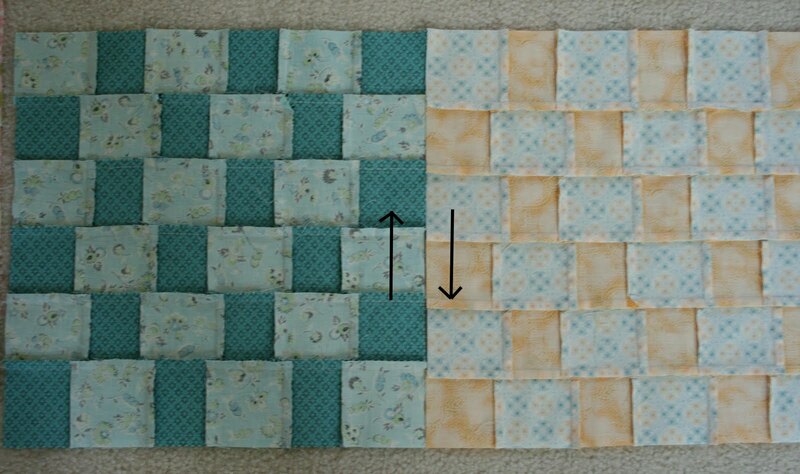 If you make a quilt using this tutorial, I'd love to see it. I've been working slowly and surely on my oh my stars! quilt. My husband thinks this would make a good king size quilt. I totally agree, but I'm not sure my arms can handle it. :) For now I'm just taking it one row at a time and I'll see where it goes. I sure do love it so far! The way the white fabric pops just makes me smile. The specifics of the quilt can be found in this post. Hello there, and welcome to week 4 of the quilt along! I hope you are still plugging away at your blocks. I managed to make my 6 new blocks this week. I also changed the two large polka dot blocks out of my pink thrifty block (see last week's post) and used the same type of fabric as the rest of the block. (on the bottom left.) It'll blend in better now, but it's still thrifty! Happy Monday to you! and Happy August, too!